The foliage on this sedge is so distinctive. 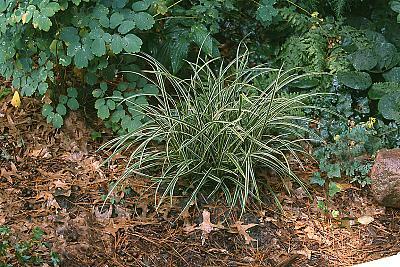 Coarser than many other sedges, it forms tightly bunched clumps of strap-like, white-striped leaves whose interplay of light and lack of direction contribute to the appearance of a much more finely textured plant than its 1/2" wide leaves would normally allow. It doesn't grow very tall, barely reaching a foot on a good day. The dark green leaves are edged with white on both sides, presenting a bolder contrast and richer colors in shaded locations. They're evergreen in southern states, but north of zone 6b they're semi-evergreen and should be cut back in late winter. Like many sedges it likes moist soil, but it can tolerate average soil as long as it doesn't dry out. Make sure that it gets enough shade to prevent burning. I really like growing 'Ice Dance' with Asarum canadense, toad lilies like Tricyrtis hirta 'Miyazaki', and columbines like Aquilegia 'Crimson Star'.